When first entering this darling cottage the current owners promptly grinned and said "This will do" and thus was born "Thistle Dew". 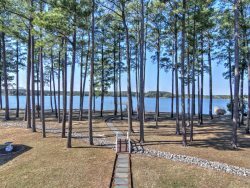 This cottage packs a punch with amenities typically dedicated to larger homes - private dock, pool, billiards room, two master bedrooms and fresh decorating. Love St. Michaels? You could easily bike the 4 1/2 miles to town and enjoy tacos and sangria at Gina's or brick oven pizza at Ava's. Interested in Easton? A few extra miles takes you right to the Avalon Theatre for a music show or a cocktail at the Historic Tidewater Inn's Hunter's Tavern. Then again, you may not want to leave Thistle Dew at all. The shaded deck, relaxing screened porch, lovely pool, and Oak Creek views might just anchor you to the property. Water Toys Included: (1) Canoe and (1) Kayak. To ensure proper sizing for your group, please bring your own life jackets, or we can recommend a rental agency. What a great home.... we love to cook family meals and Thistle Dew has a wonderful galley kitchen. We did ask for some repairs which were taken care of the same day! We couldnt ask for more.... beautiful home and weather! This was our 2nd rental with ESVR and are very happy with both experiences! My daughter got married at the Chesapeake Bay Maritime Museum and the location of the house was perfect! Other than the condition of the pool initially everything was just perfect! Even the issue with the pool was handled swiftly. It was my daughters wedding week and were were having multiple celebrations so I requested the lawn be cut earlier than planned. This was no problem and they were out almost immediately! The home provided the perfect backdrop for gorgeous pictures that will be treasured forever. **** This is an eastern shore vacation rental, not really your airbnb private host rental, so pay attention, as i didn't, and got some surprises. The property was just as described, enough space for me and my family to spent a long weekend, clean sheets and enough towels for all of us. There is plenty of living space indoor and outdoor as well, very important when hanging out with a big family. We have enjoyed our time by the water, but the house is almost at the end of the bay so not a lot of water movement there. We were still able to do some kayaking and fishing. this house is located on a quiet street, feels more like a community to me, so if you are looking for a property away from others, this may not be the right spot. We had privacy and have not been bothered at all, but keep in mind, neighbors are close. Overall disputing the issues with check in, where we didn't get directions with door code provided to us, disputing numerous phone calls and emails (this is not a private host, easy to reach at any time, so after hours you may have trouble reaching a live person as we did), this property was a good choice for our family long weekend gateway. Public response Hi Marta, thank you for your feedback and we're glad to hear you enjoyed the property! We apologize for the mix up regarding the check in code, please know that we have never had communication errors with the code before and have taken steps to make sure this is not an issue in the future. While renting with Eastern Shore Vacation Rentals is certainly different than renting through a private host, we have daily office hours in the summer as well as a technician on call for any emergencies after hours, and strive to ensure that our guests can always reach us should such an issue arise. In addition we have an excellent guest services team in place to help with any questions or concerns before or during your stay and to make sure you have the best trip possible! Thanks again for choosing ESVR and we hope you enjoyed your time on the Eastern Shore! The experience couldn't be more customer friendly- from selecting the property that is just right for your family's needs to answering questions about the property after hooking ("what kind of life jackets are available?") to the incredible ease of check In and check out. The property itself was as advertised. This cottage was fabulous! The weather had turned quite cool and we were able to enjoy a fire every evening - the gas fireplace was a real plus! This score is based on the excellent service we received. Our large family was in St. Michaels to attend a family wedding, and your staff worked with us to find two houses right near one another (actually next door to one another) to house everyone! They were so easy to work with and so accommodating. We have rented from various companies over the years, and I can honestly say, this was the most pleasant experience we have ever had working with a rental agency. I have both called and exchanged emails with your office about early check-ins and late check-outs. You've responded to both and kindly allowed us to do both of those options. The lady I spoke with was lovely and you've been very accommodating. Thank you. Especially appreciated since we were travelling this time with our very young grandchildren. I have confidence renting with your organization. Not only do I know that your properties are beautifully kept up, but that I can call you if needs be. We have rented several properties now since first renting this house, Thistle Dew, in 2012. We particularly love Thistle Dew. The other properties were perfect for the larger family groups we had, attending weddings etc. But Thistle Dew we keep coming back to. My sister in law stayed with us again this visit. She recently rented something in North Carolina and said it was not nearly as good an experience. The house wasn't in great condition nor the utensils etc. and no-one to call. We all absolutely LOVE Thistle Dew. We love the house, it's pretty and fun decorating and it's setting. From sunup to sundown the setting is perfect and stunning. The pool is a real treat when the weather is good and the availability of the canoes is much appreciated by everyone except the dog, who we particularly enjoy being able to bring with us on vacation. We hate to put him in the kennel and he just loves Thistle Dew too. This was the first time we've had a full house - including a toddler and a newborn - but it still felt comfortable. It is a very well equipped cottage too. We could not ask for anything more. It's fun, it's beautiful and, even when we had a couple of days of bad weather on this visit, we couldn't have enjoyed ourselves more. We are so happy that the owners allow us to share their lovely property. I hope we can come back. Soon. Professional, efficient and hassle free experience. Waterfront, pool, screened in porch, location, 4 bedrooms, 3 baths. Thistle Dew is perfect! Great view, nice pool, well-stocked kitchen. I would love to see the square footage included in your listings. The photos of this property on your website made it appear to be larger than it is.